Mini Drapery Fold! I've seen it and now I made one for myself. I got inspired by Dawn Olchefske. 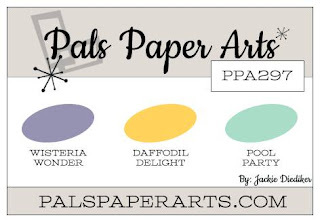 Pals Paper Arts colors for this week are what I used (substituted Mint Macaron for Pool Party!) to create my very own designer paper, which I stamped onto Whisper White envelope paper for ease of folding on the score lines. Suite Sayings was my stamp set for the sentiment (can't HELP but sing the Beatles song!) and Petite Petals are my flowers. I hope you enjoyed looking today and that you are inspired. One more day to comment on THIS post for a chance at Blog Candy! 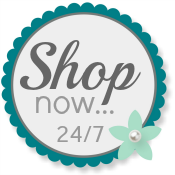 Use my Online Store any time to order your own Stampin' Up! products. This is just lovely. Thanks for the inspiration for making the pleated fold in the mini version. Soooo very cute with it's little skirt! Thanks for playing PPA this week. 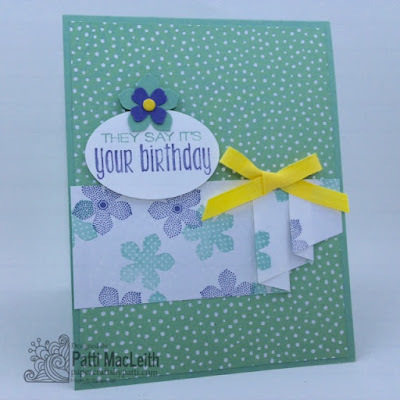 Patti - I adore how you've used these colors to create such a soft and beautiful project. Such a great card! 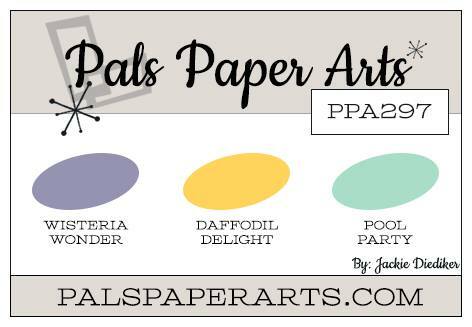 Thank you so much for playing along with this week's Pals Paper Arts Color Challenge! Very sweet card, Patti. I keep seeing this fold used and while I haven't tried it out yet, I can't wait to see how it all comes together. I love your take on the colors, the dotted dsp really pops! Thank you so much for joining us this week at the Pals Paper Arts Challenge, we hope you play along with us again soon!